This sword belongs toJyo-Jyo saku ranking. Blade length : 70.7 cm or 27.83 inches. Sori : 2.0 cm or 0.79 inches. Width at the hamachi : 2.81 cm or 1.11 inches. 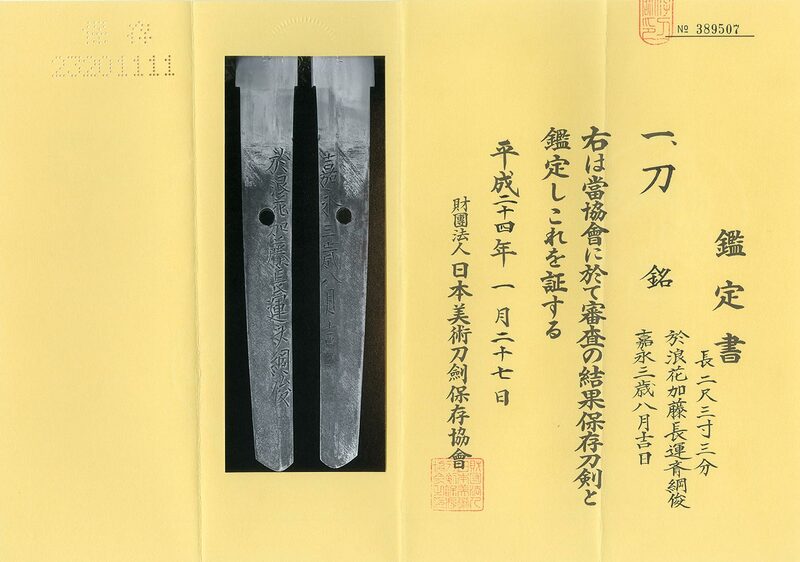 Width at the Kissaki : 1.73 cm or inches. Kasane : 0.69 cm or 0.272 inches. with deep sori and regular kissaki size. Special feature:Katou Cyousai Tsunatoshi is the third son of Katou Izuminokami Kunihide. He worked as a smith in Uesugi family, the owner of Dewa Yonezawa domain. Katou Tsunayoshi Katou Tsunahide are his real brother. by Suishinshi Masahide in Edo. and valued rather low quality compared with Masahide. Some of his good pieces are BIzenden with gonome midair ha. Takahashi Naganobu and Seryuken Moritoshi and so on. Especially he liked Seryuken Moritoshi personally. Both Tsunatoshi and Koyama munetsugu's hamon is very similar. Some differences are mentioned following. and round shaped hamon(70%)boshi hamon. This Tsunatoshi hamon is midarekomi boshi which is rare hamon. Nioi deki cyoji midare hamon. Boshi:Midarekomi style. Koshirae : Mogarashi issaku Koshirae. the mimi is cvered by rope shape gold color. and insects are engraved with gold color. autumn flowers and insects are engraved with gold color. From Aoi Art: This sword looks Koyama Munetsugu beautifut nice Cyoji midare and midarekomi style Boshi. Koshirae is all matching Mino school and mogarashi style fittings. Aoi Art estimation Paper and NBTHK Hozon Paper: whole Oshigata.